There may be a not-so-obvious impact on the furniture industry from the Government's planned Digital Services Tax. The five-year partnership between the two businesses is coming to an end. Sold stake in major Chinese operation at the turn of the year. Testing, testing. While the world's biggest furniture retailer tries new things, perhaps the answer lies in acquisitions? 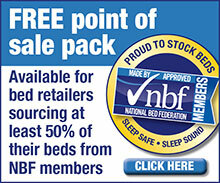 Commentary: Is Vispring Britain's most valuable bed company? A balance sheet analysis of Britain's top bed companies would place Vispring relatively low in the list of Britain's most valuable mattress companies. How very misleading. A look into the department store chain's big-ticket plans. A look at the upholstery category shows why these tariffs matter. Unboxing the cash situation at the emerging direct-to-consumer and wholesale mattress brand? It seems fitting that in the same month that WorldStores is phased out as a brand by Dunelm that Argos has been named Large Online Bed Retailer of the Year. The Co-op was once one of the UK's largest retailers of furniture, running dedicated stores and large departments in multi-category shops. Rising input costs have been a recurring theme over the past two years. Taskers reported a seven-figure loss in 2017–18 but there are positive signs coming from the North West business, whose ongoing restructure will complete next year. More on UK furniture, bedding performance at Steinhoff. Right at the very beginning of the current vogue for rolling, folding and boxing mattresses, one of the new direct-to-consumer market entrants had an interesting marketing strapline. Upholstery market analysis: the Far East market making UK headway. Making sense of Fabb Sofas' closure is not an easy task. Analysis of the UK's two leading sofa chains. 2017 sales, profits at Ashley Manor, AMX Design and Alexander and James, plus a look at Q1 2018. The reasons we think Harveys makes for an unlikely disposal candidate. Mattress startups can't wait too long before making proper money.